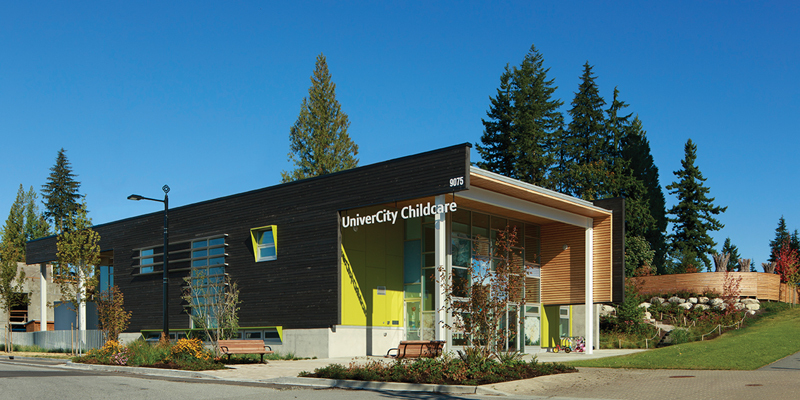 Located at the heart of Simon Fraser’s sustainable campus community, the UniverCity Childcare Centre was the seventh building to register for the Living Building Challenge worldwide. The childcare project was sustainable community building in microcosm, a reminder, from consultation to implementation, of the need to apply best practices at every step. We began with a series of workshops, first with internal stakeholders and then with our governmental and regulatory partners. Then we sat down with the clients, a clutch of three- to five-year-olds, and invited them to submit their best ideas. This was the most fun. In the usual design charrette (that is, one involving adults), you’re often encouraging people to “think outside the box.” Well, preschoolers have no conception that there ever was a box. They were entirely unrestrained in their creativity. That said, I hope they weren’t too disappointed that we didn’t wind up with a structure of white tree houses on crooked sticks. Blue-sky dreaming notwithstanding, we needed to honour the rules of space and scale, access and safety. We were striving to meet the principles of the Reggio Emilia approach to childcare that had been identified from the outset by our partners at the SFU Childcare Society. Parents and professionals in the Reggio Emilia region of Italy designed this preschool philosophy after the Second World War, in the sobering light of the war’s devastation and in recognition of the importance of early childhood development. They created a program founded on principles of respect, responsibility, community and a self-guided curriculum, and based on exploration and discovery in a supportive and enriching environment. It was a perfect fit with our goals of sustainable community building. But we had another challenge—one that I imposed myself when [Dale] Mikkelsen [Director of Development, SFU Community Trust] first raised the childcare alternative. I said, “Sure! We can attempt a Living Building, on condition that it not cost a dime more than a conventional project. No green premium.” That’s where the innovations and accommodations from HCMA, Ledcor, and our other partners became so crucial. A view of the interior of the UniverCity Childcare Centre. As we had seen with Verdant [the surrounding residential neighbourhood], buildings that are well designed and well equipped from the outset can run more efficiently and more sustainably. If you begin with a structure that is well situated, well insulated and angled to take best advantage of radiant heat from the sun, you reduce the need for heating and lighting hardware, as well as the ongoing expense. We also made a deal with UniverCity’s new District Energy Utility to share energy from a rooftop solar-thermal array. This installation generates more thermal energy than the building can use, allowing us to sell the remainder back to the utility, offsetting both costs and the carbon footprint of the electricity that we still need for nighttime lighting. example, the provincial electrical utility, BC Hydro, has a whole division called Power Smart, dedicated to helping clients conserve energy, thereby reducing the need for the utility to fund expensive capital expansions of its own. The folks at Power Smart loved the childcare project, even offering a grant to help pay for the solar array. 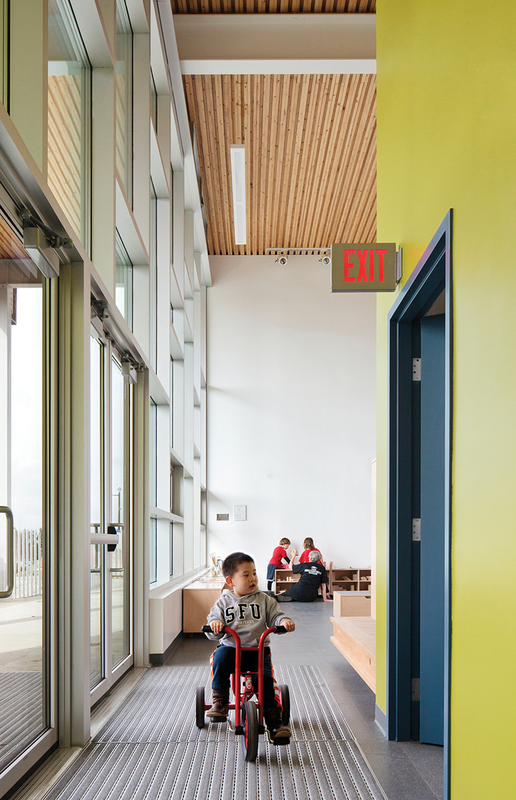 But when it came time to hook the new building into the grid, BC Hydro’s services division ruled that the centre’s energy requirements were insufficient to justify a conventional connection and assessed a connection charge that was larger than the Power Smart grant. Having encouraged us to build a “Power Smart” building, they proposed to penalize us as a poor prospective customer. For the record, it all turned out in the end. For that, I would like to repeat a personal thanks to then-BC Hydro Chair Bob Elton, who, on learning about the mixed messages coming from his organization, intervened to have our connection charge waived. The regulatory resistance to change arose again when we began negotiating a water connection. The Living Building Challenge involves being water independent, to use and reuse only what falls from the sky and to treat any run-off to the satisfaction of the salmon downstream. The Living Building standard forbids the use of noxious chemicals, such as chlorine. Again, senior municipal and health officials expressed admiration for those goals. But the municipal officials, whose job is to enforce the law as written, were unable to approve the re-use of water for potable purposes. To target the Living Building Challenge criteria, the design includes exceptional indoor air quality along with locally and responsibly sourced materials. It treats and recycles both greywater and blackwater for non-potable uses. Everyone in Burnaby is mandated by law to use municipally sourced, chlorinated water for drinking, with no exceptions for starry-eyed innovators. When we suggested that our toddler-oriented infrastructure would treat and recycle blackwater for use in toilet flushing and irrigation, the regulators declined the application. On that point, however, we ultimately found a compromise, with the regulator supporting water re-use for non-potable purposes, making it possible to link the child-care centre to the raingardens, the underground infiltration fields that are a big part of the award-winning UniverCity stormwater system. Another obstacle came with the Living Building requirement that no part of the building or grounds include anything that is “red-listed”—that is, construction materials that are suspect for health or environmental reasons. The problem we ran into was suppliers who often couldn’t or wouldn’t guarantee or even disclose the contents of their products. Sometimes they said these details were proprietary information. Sometimes they admitted that they just didn’t know because they incorporated components from other vendors. We eventually sent out a complete Red List including substances prohibited by the Living Future Institute, and asked suppliers for a statement confirming that their products contained none of these materials. All of the foregoing points to two problems for innovators in a fast-paced but heavily regulated world. First, the regulators who often attract so much criticism are the same people who help assure British Columbians the highest life expectancy in Canada (and among the highest in the world). Few public initiatives have saved more lives than the provision of chlorinated water. We seldom find ourselves faced with obtuse, unreasonable people, faceless bureaucrats who punch a clock and then sit at a desk ignoring anything that isn’t easy. We are dealing rather with people who have, themselves, fought to establish some of the best standards on the planet and who are justifiably wary about making exceptions. Second, as our health and environmental understanding evolves, it’s hard to keep up. For example, the Living Building Responsible Industry prerequisite requires the use of wood that carries a Forest Stewardship Council certification. This is one of several good certification schemes that promote conscientious forestry practices. But the FSC stamp was not available for beetle-damaged Mountain Pine, which for availability and responsibility was the perfect product. The Mountain Pine beetle has been at home in British Columbia forests forever. It was a regional nuisance until climate change allowed a population explosion, as more beetles survived warmer winters only to kill so many trees that astronauts can now witness the damage from the window of the International Space Station. For several years, those trees, while dead, are still structurally sound. If the wood is harvested and used quickly, it serves to sequester carbon for the lifetime of the buildings in question. Left to rot or burn, the same trees will become another source of greenhouse gas emissions. So, we had a sustainable solution, but no permission. We finally won approval, but only after proving supply chain continuity in the same way a Crown prosecutor must prove that a critical piece of evidence has been tracked and protected, right up to its day in court. There was one last hurdle to meet the Living Building Challenge standard, and this one could be crippling for people outside well-serviced manufacturing centres. The International Living Future Institute requires that all sustainable energy technology be obtained from within 15,000 kilometres, that consultants travel no farther than 2,500 kilometres, and that building materials and products must be sourced from within 500 kilometres for the heaviest materials, and 2,000 kilometres for the lightest. These were hard targets to meet, even in the urbanized Pacific Northwest. They would be easier to achieve around Ontario’s Golden Triangle. But for communities in the far north, or even the likes of Fort St. John, Fort McMurray, Flin Flon or Churchill, this restriction could block the chance of ever achieving a Living Building certification. But bad news can have a good corollary. We had a wonderful time finding local suppliers—especially when it came to things like outdoor play spaces. The Reggio Emilia system honours three teachers: the literal teachers who work with students; the parents who support their education; and the environment in which they learn. Thanks to a number of local artists and artisans, our childcare environment is spectacular. is now better prepared to implement the most advanced solutions wherever they are working. We might not have achieved the full goal of building a completely sustainable community yet, but we certainly have developed a model for sustainable practices. As to the childcare centre itself, we are incredibly proud of the result. It’s been a hit with the client group and the International Living Future Institute had confirmed by press time that we had achieved five of the six petals on a performance basis. Of course, we still need to reach the sixth, but even the Institute’s founder and director [Jason] McLennan acknowledges that the Living Building Challenge is tough. By way of context, he is fond of saying that if the LEED Gold standard is analogous to ride-your-bike-to-work day, the Living Building Challenge is the Tour de France: it’s all about proving yourself over the long haul. 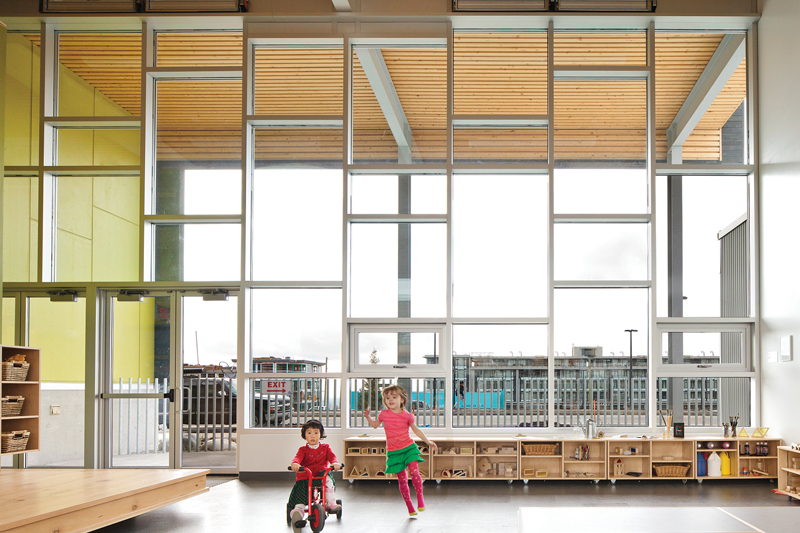 We knew that when we started, and we are still in the race and still on track to celebrate the childcare centre as the first official Living Building in Canada. Excerpted from Building Community: Defining, Designing, Developing UniverCity (Ecotone Publishing, 2018). Gordon Harris is an urban planner and real estate market analyst who has been President and CEO of SFU Community Trust since 2007, leading the development of UniverCity. Richard Littlemore is an author and journalist who specializes in sustainable development and academic affairs.